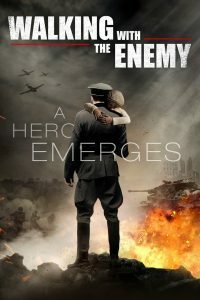 To date, I have not blogged about a movie or my opinion of it; however, Walking with the Enemy is intensely powerful and left an emotional impact on my mind as well as in my heart. I can’t stop thinking about it. As a result, I feel compelled to share this thought provoking film with my readers. It is based on a true story – set in Hungary during World War II – and spotlights real life heroes. First of all, I must emphasis that I had never heard of this 2014 movie. I picked the DVD off of the shelves at my local library in Mooresville. It was a random choice. Except for Ben Kingsley, I did not know any of the actors (Jonas Armstrong, Simon Kunz, Hannah Tointon, Simon Dutton and Burn Gorman,) but the cover looked intriguing. I love history and consider myself fairly knowledgeable regarding World War II, Hitler’s Germany, Fascism and the Holocaust; however, I did learn a few things from this movie. In addition, I truly believe that we should never forget the horrors of the Holocaust. I thank Hollywood, writer Kenny Golde and director Mark Schmidt for telling this story and keeping the memory alive. Although this is a graphic and painful account of a horrific time in history, Walking with the Enemy is – for some reason — rated PG-13. I don’t recommend young teens watching this movie without an adult; however, I do think every high school student should see this movie . . . learn from past evils and recognize what courage and true heroism are . . . and – above all – remember.